Ce document au format PDF 1.4 a été généré par PrintServer160 / Corel PDF Engine Version 16.0.0.427, et a été envoyé sur fichier-pdf.fr le 10/04/2013 à 16:14, depuis l'adresse IP 97.125.x.x. La présente page de téléchargement du fichier a été vue 1394 fois. Taille du document: 116 Ko (4 pages). “The wages of sin is death!” Romans 6:23. “Saints. . . keep the commandments of God AND the faith of Jesus.” Revelation 14:12. 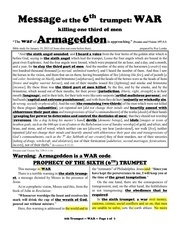 We are at the time of the fifth and sixth trumpet. D&amp;V 260:3:17. The six trumpets have resounded in heaven. Some were of our epoch, and others were not. D&amp;V 259:1:7. 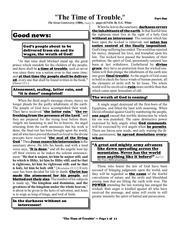 The Remnant Church has received the message of the fifth trumpet. 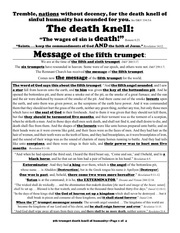 message of the fifth trumpet for the world. black horse, and he that sat on him had a pair of balances in his hand.” Revelation 6:5.
whose name. . . is Abaddon [Destruction], but in the Greek tongue his name is Apollyon [Destroyer]. One woe is past, and, behold, there come two woes more hereafter.” Revelation 9:11-12. “Satan is at the command; it is he, the EXTERMINATOR.” Dreams and Visions 244:12:14.
shall be set up. . . Blessed is he that waiteth, and cometh to the thousand three hundred thirty-five days.” Daniel 12:10-12.
shall break in pieces and consume all these kingdoms, and it shall stand forever.” Daniel 2:44.
become the kingdoms of our Lord and of his christ, and he shall reign forever and ever.” Revelation 11:15. “And God shall wipe away all tears from their eyes, and there shall be no more death, neither sorrow.” Revelation 21:4.
chapter 9:1-12 a star falling upon the earth. had not yet received the order for tormenting the men. received the power, to torment the nations. impossible for the nations to escape their power. bankruptcy. All the nations will fall. order to plunge humanity into torments. men being able to see this prophecy. sowed death on his way. 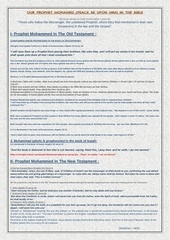 Dreams and Visions 325:3:1-11.
terrible! Dreams and Visions 259:2:15.
allowed me to see the magnitude of the catastrophe. country, isolated from the cities. Visions, the world finds itself in a thick darkness. There is no sun. I saw like a smoke that hides the day. and sun. The air will not be breathable and poisoned. earth. She is going toward her destruction. The vegetables and the fruits will be stopped in their growth. Everything will be dispersed, divided, separated. Nothing will any longer be able to get her back up. the earth; glimmers of fire put the firmament ablaze. volcano. It was panic, fear. sins, as to put myself in question? like a thunder clap in a blue sky. “Escape for thy life!” See Genesis 19:17.
opened, provoking upon the earth unexpected catastrophes for men. in the [6 6 6] UPC. I saw, no more water, no more rain, no more bees. these unexpected phenomena will happen. 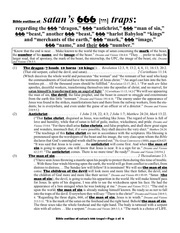 which is the sixth trumpet. Ce fichier a été mis en ligne par un utilisateur du site. Identifiant unique du document: 00167876.